At long last, the Glock 17 has arrived as an airsoft pistol. This highly sought 1:1 replica of the 4th Gen. 17 is sure to become a fan favorite during close-quarters airsoft combat or even as a tactical trainer for those looking to cut costs on expensive traditional ammunition. The Glock 17 has grown in popularity since its release in 1982 to become one of the most popular firearms among police and military personnel across the globe and the official sidearm of the FBI. This airsoft variant includes features like an adjustable hop-up, full-metal slide, official Glock markings, and the distinctive Glock trigger that functions just like the real steel. For a realistic tactical experience, this gas fueled Glock 17 launches its BBs at 300 fps and blows back the slide every time you shoot. 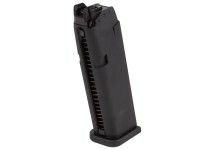 Each magazine holds 20 rounds to keep you in the action longer without reloading. The wait for officially licensed Glock replicas is over! Get yours today for the ultimate airsoft sidearm and hone your shooting technique to perfection. Things I liked: Very similar to a real Glock 17 with a pretty smooth action. Things I would have changed: The weight is not the same, mostly because of the use of cheap, lightweight plastic. Not nearly as well made as another 1911 air soft I have from Tokyo Marui, especially at this price. Components are very cheap metal and plastic, I doubt they'll hold up for very long. 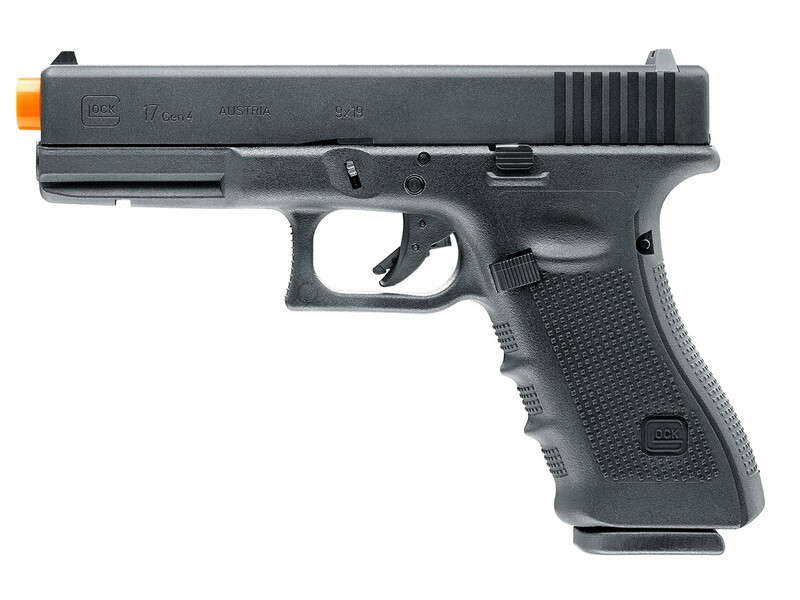 What others should know: Not a lot of choices if you're looking for a Glock 17 imitation. But for the money, this one is pretty cheaply made. Things I liked: This must be the best practice BB gun I've tried. 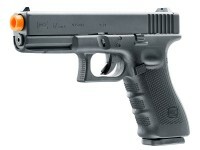 I'm planning to buy the Glock 19 Gen 3 GBB Airsoft Pistol also. 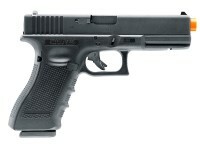 I doubt the Gen 3 grip on the 19 is anywhere as impressive as the Gen 4 ergonomics and grip quality reproduction. Gen 3 Glocks look classic but they're should be a long barrel model with RMR preconfigured or bundled, and a Glock 30/26 "sub-compact" models too for us to buy up. I never usually use airsoft outside in between range sessions, but this gbb pistol is amazing. I don't recommend removing the orange tip unless you're completely privately shooting targets in a fenced yard. Of course the tip removes from the amazing craftsmanship, but, yes, it can be removed. The licensed Glock markings are not painted white at least. But don't worry, the airsoft bb gun is apparently an airsoft gbb to anybody near or using it. Just follow the rules because it's not easy to know it's a replica from afar. Great site. Things I would have changed: I guess I'd drop the price 40 bucks. That would be fair to me, but it is both a realistic replica and very usable and durable bb gun. Similar to my preferred big bore duty sized Glocks and it's neat. Things I liked: It felt good in my hand and it felt real when it comes the weight. Things I would have changed: I would have liked to have a threaded barrel. I often shoot with a suppressor. What others should know: It had more realistic blow back than I expected and it shot well. I recently purchased 2 of the Glock 17 GBB, as well as 2 extra mags for my business. I teach all sorts of tactical training at folk's homes. What do I need to gas up these mags? Is this green gas or CO2. I haven't seen one yet, though I would think we will see them at some point.